Gerrard & Associates is a worldwide distributor for the Binmaster complete line of point level indicators. The Mini-Rotary is an economical, compact rotary level control that has been designed for use in small bins and hoppers. Designed for use in hazardous locations, featuring CSA Class I, Groups C & D and Class II, Groups E,F & G ratings. Offers "no probe intrusion" and designed for space constrained areas or applications where material flow or bridging may damage a standard probe. . Features remote electronics located in a housing that is separated from the probe making it suitable for high temperature, high vibration, or hazardous environments. 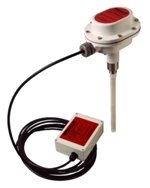 BinMaster�s standard piezoelectric driven vibration type point level switch. It is suitable for both top and side mount applications and is ideal for a wide variety of dry and bulk powder materials including extremely light, fluffy materials. Uses a steel-rope reinforced cable and allows for insertion lengths from 19 inches up to 19 feet. Intended for top mount applications and can be used to detect materials that are heavy, medium or light weight including those which are extremely light and fluffy. Built specifically for higher process temperatures up to 482°F (250°C). The Maxima+ is BinMaster�s most advanced rotary level indicator. In addition to a de-energizing motor to reduce motor burnout, it has the ability to continuously self-diagnose and alarm in the event of a failure. . Probes offer interference-free, fail-safe operation & "Quick-Set" calibration. interference-free operation – working far below the RF level of 9 KHz at just 6 KHz. – and will not interfere with two-way radios or other equipment operating in the radio spectrum. Meet rigorous USDA, FDA and 3-A material and design standards for sanitary food and dairy processing. Offers simple and automatic calibration and external testing without having to remove the cover of the unit. Calibration takes just seconds and is performed with the use of a special magnet. .
A compact capacitance probe for reliable level measurement and plugged chute detection for liquid, powder, granular, and pelleted materials. Designed for use with a variety of heavy, medium and light materials including extremely light, fluffy materials. Intended for top mount locations, it is available in lengths from 13 inches up to 13 feet. A compact vibrating rod that is ideal for small bins, hoppers, and feeders. A pressure switch that provides simple, low cost point level control with proven, lasting reliability.